Brill claims the CEOs and the inside administrative circles of “nonprofit” hospitals make millions in annual salaries and golden parachutes. All the while, their organizations—masquerading under charitable and vaguely and not-so-vaguely religious-sounding names like “Daughters of Charity” and “Sisters of Mercy” (and perhaps even under ones like our own “Baptist” and “St. Vincent’s”)—every year hound hundreds of thousands of middle-class and lower-middle-class folks into bankruptcy. Brill doesn’t blame the doctors and nurses—their mostly just pawns. Rather, in his lengthy article he describes a wealthy and powerful ‘medical-industrial complex.’ In Washington D.C. it spends twice as much on lobbying as do the oil-and-gas and the military-and-aerospace lobbies combined. Medicine has become a shake-down operation. 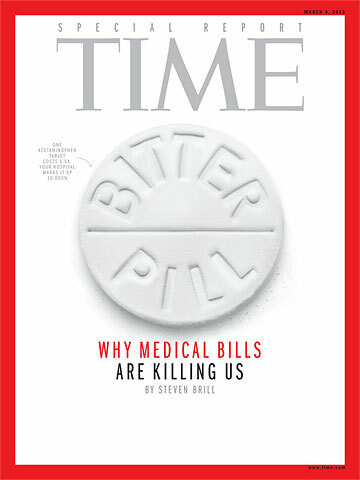 The medical device makers, pharmaceutical companies, health-care-product industries, and ‘nonprofit’ hospital chains routinely outrageously pad the bills, charging $1.50 for an aspirin and even billing for the paper cup. And those masterminding this racket are making out like bandits while every year driving hundreds of thousands of patients and their families into poverty. If a sociopath is, by definition, someone who exhibits predatory, anti-social behavior, do not the CEOs of the ‘nonprofit’ hospitals fit the bill? How else can one characterize multimillionaire CEOs who hound widows to the tune of hundreds of thousands in medical bills for their spouses’ (obviously unsuccessful) chemotherapy treatments? While these CEOs’ behavior warms the cockles of my heart (after all, I’m an avid reader of the Sociopath’s Manifesto), other less sophisticated individuals are not likely to take kindly to what Brill reports. People will be angered. The naive and idealistic will not be disabused. These simpletons will not understand that the CEO of the Daughters of Charity Health System, Robert Issai, must be hard nosed and send bill collectors to hound widows! Are there similar CEOs right here in Jaxonpool, doing the same? Only your paper can tell us. In any case, my medical bills and insurance premiums are going to go up. Why? Because life for the nonprofit hospital CEOs, the ones making annually $1.5 million and more—and those of the inner circle—just got more dangerous. People are going to go berserk. There’s going to be pillaging by the bitter. Someone dying of cancer, say, knowing that, after he’s gone, his widow and child will be made destitute by the hospital’s bill collectors, what’s to keep him from getting an assault rifle? A rifle that can discharge dozens of rounds in seconds? If he’s dying of cancer, what’s he care? He’s already under a death sentence. It’s not going to matter what happens to him after he takes out the CEO. It may not matter to the shooter, but it’s going to matter to you and me, because we’re the ones who’re going to have to pay. Medical bills are going to be even more padded to cover a whole new set of charges. If patients were able to go to the hospital chargemaster, which evidently they can’t, they’d see new line items for the CEO’s bodyguards, armored limousine, and bullet-proof vests. Items in the chargemaster for armed personnel in the hospital’s main offices. The 24/7 security detail to protect the CEO’s private residence. If the past is any indication, the charges’ll be ridiculously marked up, with no relation to the actual cost of creating the item or providing the service. So, thanks, Steven Brill! Thanks a lot. Thanks for nothing. Now how’re we going to defend our system of sociopathologized medicine? Okay, finally, I feel the sandman coming back. Time now for some shut eye. I’ll sleep easier, knowing I’ve got something in common with some of the biggest of the big shot sociopaths—the ability to sleep at night.